RTÉ Television has implemented a web based system to support its commissioning activities from initial call for programme ideas through to evaluation of programme proposals..
RTÉ Television is responsible for sourcing and commissioning programming for television broadcast from the independent productions sector. RTÉ has always commissioned some independently made programmes, but began to commission independent productions in a major way in response to the Broadcasting Authority (Amendment) Act 1993. The intention was to expand the range and diversity of Irish-made programmes on our screens and to foster new sources of creativity and energy within the independent television production sector. Independent productions have become a core ingredient of RTÉ’s television schedules. RTÉ’s spend on independent commissions in 2005 was approximately €70m with approximately 1000 hours of content being produced. RTÉ has put in place an e-Commissioning solution that facilitates the electronic submission of programme ideas from the independent television production sector and the online evaluation of those submissions according to the detailed evaluation criteria and guidelines already in place. Prior to this solution being deployed, the commissioning process was handled manually. This was characterised by a very intense period of activity at the start of September where up to 1400 paper submissions were received, recorded, distributed and acknowledged. These activities lasted approximately ten days. The submissions were then grouped, assessed independently by teams of three editorial staff over two assessment cycles, those results collated, signed off and input to a computer system. This activity lasted approximately 12 weeks. All communication was by manual typed email. A website for producers to register and to upload submissions securely (with associated documentation), to receive acknowledgements and to track the status of their proposals. The system facilitates an external audit that verifies the integrity and accuracy of the system. Technically this consists of a web server front end, a Business Process Management application server tier and a database server tier. Windows 2003 operating systems on VMWARE provide the server platform while Microsoft SQL Server 2005 provides the database platform. The solution is based around Metastorm BPM version 7 and specifically around their e-Commissioning process POD. What business value was created from the project? The solution was deployed in time for the annual 2008 Open Round. This round closed at the end of August 2007. Improved turnaround in assessment activity. The activities around the closing date for proposals that took ten working days in 2006 completed in just 6 minutes in the new system with no human intervention. The time taken for assessment activities is greatly reduced. We have observed a time saving of at least two weeks for the initial assessment of proposals. Further time savings are expected as the assessment processes continue towards conclusion at the end of November 2007. These efficiencies release administrative and editorial capacity which can be directed towards the selection and development of television programme ideas and productions. Improves RTÉ’s ability to handle significant volumes of programme proposals and ideas in a more effective and efficient manner. There was a 50% increase in commissioning spend between 2004 and 2005 with almost a doubling in hours output. With an increase in licence fee income and a drive to increase programming commissioned from the independent sector, the business has required that this additional capacity is delivered with minimal impact on staff resources. 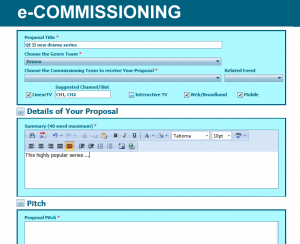 The e-Commissioning solution has enabled a greater capacity to process proposals from television producers based on existing staff resources. Independent Producers receive faster responses from RTÉ to their programme proposals. They can now track online the progress of their individual programme proposals within the commissioning process. This improves the relationship between RTÉ and the independent television production sector and reduces the overhead of communicating with those producers in a manual and individual way. 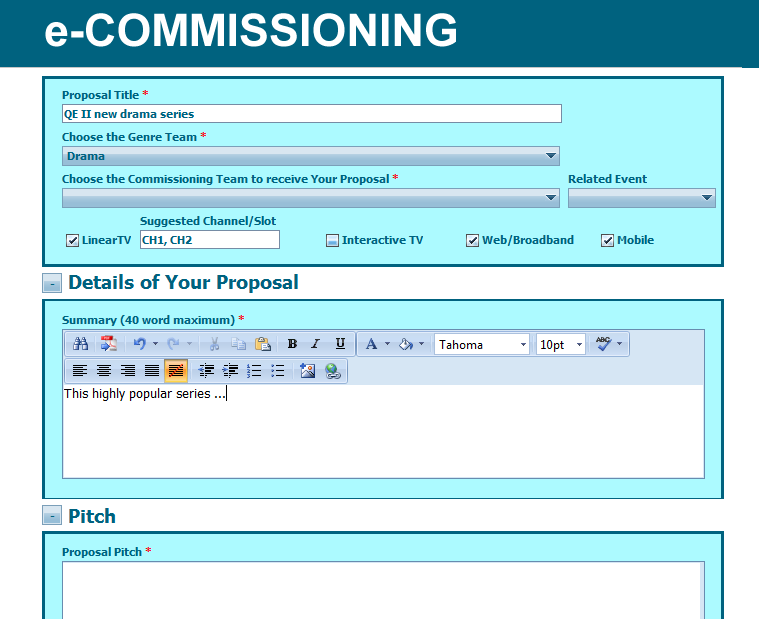 Feedback from Television Producers confirms that they are very pleased with the e-Commissioning system. This contributes to the perception of RTÉ Television as a professional commissioning authority that has provided an effective and efficient method of engaging with its suppliers and partners. There has been a tangible cost saving to Television Producers in submitting programme proposals: collaboration costs are reduced and proposal printing and distribution costs are eliminated. Moreover, Television Producers can make submissions more quickly and efficiently by completing the process online. RTÉ Commissions television programmes from the Independent television production sector in order to expand the range and diversity of Irish-made programmes on our screens and to foster new sources of creativity and energy within the independent television production sector. This project marks a significant transition for programme makers and RTÉ commissioning staff from a paper-based manual commissioning process to a fully electronic one. Though this is a relatively simple IT solution it has delivered tremendous value to programme makers and to RTÉ Television staff and has improved the perception of RTÉ as a professional and efficient commissioning authority. The solution has released editorial, creative and administrative capacity that was previously consumed in the conduct of manual commissioning processes. Moreover, there is an expectation that the editorial and creative capacity released with the implementation of this solution, will in the future lead to an improvement in the volume and/or quality of commissioned programming on air. Nesscomp developed a similar e-Commissioning system for the BBC Television, which delivered similar business results.